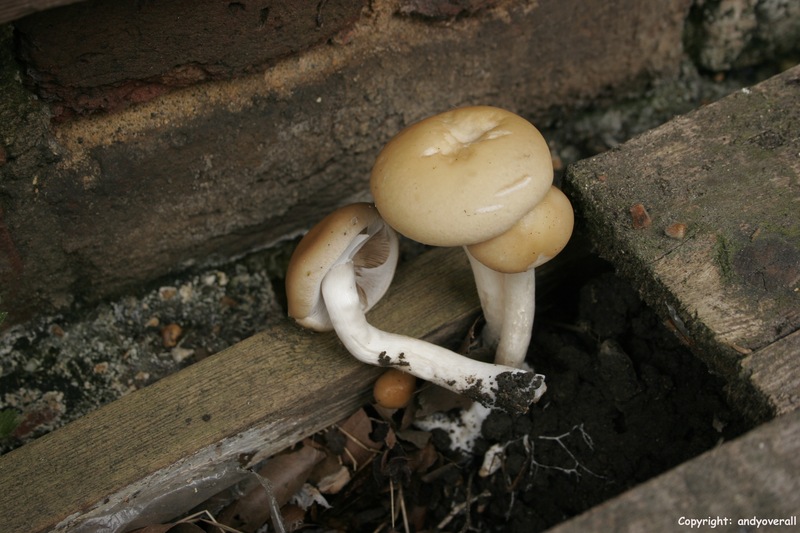 May 21st – Kenwood – Agrocybe praecox – The Spring Fieldcap. Now, I would go along with the spring bit but not sure about the fieldcap epithet as this species is most often found on wood chip mulch and other such rich based substrates but as it is shared with all other members of the genus, then best left alone. Often among newly laid rose beds and such like. This collection was fruiting directly on soil, most probably enriched by compost as it was inside a cold frame inside the gardeners bothy on the Kenwood Estate. It was also growing out alongside where some protective sheeting had been laid down. It is a typical spring species but not entirely restricted to these early months, though this is most probably the best time to catch it. Note the partial veil coming away from the edge the cap, revealing the pale gills beneath, the veil will form an annulus (ring) on the stem, which helps to separate this species from the less common, non-native, look-alike, Agrocybe putaminum, as this species has no partial veil to begin with.